Extracted Honey, Chunk Honey, Comb Honey. Pure unprocessed NH Wildflower Honey. Our honey is never heat treated. We strain our honey through 600 micron mesh, not though paper filters. This leaved traces of pollen that is believed to help with seasonal allergies. 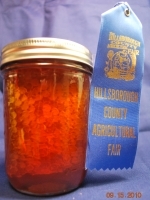 Limited quantities of COMB honey are available. Comb honey is honey still in the comb. The wax gives a nice crisp crunch when you bit on it, finishing like gum, you can eat the wax or not. Chunk honey is a piece of comb honey immersed in liquid honey. You can remove and eat the comb, or spread it like jam in toast. All the natural goodness of RAW honey. Believed to help with pollen allergies. A healthy alternative to sugar or corn syrup. Send us any question on the items above, and we get back to you.